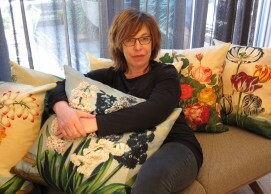 After a glittering career as a Set Decorator on acclaimed international feature films, Academy Award nominee Kerrie Brown opened her own Design Studio in Sydney in 2012, producing a wide range of highly original and sophisticated soft furnishings for both the domestic and commercial market. Her bold vision and cheeky sense of fun are evident in all her designs - enjoy her exotic upholstery fabrics, stylish wallpaper, colourful cushions and sensational lampshades! All Kerrie Brown products are designed and manufactured in Australia.